Did I Really See Swim Stuff In The Stores? Yep. Cue summer, yay! I can’t wait for warm weather. Moving on…..I would like to speak about one of my least favorite swim products. (Yes, I have more than one). Water wings or floaties. I saw oodles of them at Target, Wal-Mart and The Dollar Store. Water wings are NOT safety devices. You do not have to take my word for it. The National Swimming Pool Fountain said so as well. The inflatable material is made of cheap vinyl, it can puncture, deflate, or they can slip off your child’s arms. I have seen children pull out the valve and let all the air out! Kids are clever. Most of these products cost a whole dollar. They are NOT Coast Guard approved. Need I say more? It can be very tempting to buy a couple pairs of the adorable Nemo water wings – but please don’t. If your baby or child cannot swim, they are at risk for drowning. It is n-o-t cute to let them float around in the shallow end. If your child rolls onto their stomach, water wings prevent them from turning over for precious air. It may be cute to have them jump in the water with the water wings but it is not safe. Children think they can ‘swim’ or ‘float’. Water wings give your child a false sense of security. They often become daring and venture into deeper water. Imagine the horror. Children are not the only ones who become too dependent on water wings or floaties. There is no sneaking in a few pages of your novel or a couple of texts while they are floating around in the water with the water wings on. You can never take your eyes off your child when they are in the water. Never. Water wings prevent your child from later learning proper swimming techniques. They put your child in a ‘vertical’ position. Children have to work extra hard to find the correct center of balance. How am I going to teach your child to do the ‘superman glide’ (prone guide)? They will be hanging onto me for dear life. What are the solutions? Enroll your children in professional swim lessons. It is never too early. Yes, babies can learn to ‘swim’. 😊 If this is not possible right now choose a proper fitting life vest that is Coast Guard approved. How do you know if it is Coast Guard approved? There will be a label on the inside of the life vest which proudly says “Coast Guard Approved”. Look for the symbol on the life jacket itself that shows it meets their standards for safety. Still going strong at 90 years old! Swim season is almost here! YAY!!! Let’s get in shape with these pool exercises. (I didn’t say they would be easy). Nothing good comes easy. Sweat equity is what it takes. A strong core is a must for swimming and a-l-l sports. Are you ready for swim suit season? He often arrives at the YMCA before the sun. Jay Rentzel is in the water by 7 a.m. to lead the exercise class that is never too large and never takes a break. He has been calling out this routine of stretches, twists and turns for nearly the last 30 years. Five days a week, an hour at a time. Jay Rentzel just turned 91. The only things that get in the way are warm-weather golf outings, a rare hospital recovery or a recent icy day when the YMCA didn’t open until 8. Rentzel smiles often as he gives the commands to his class, most days just five or six members. He pushes and pulls his limbs hard through the water, showing off leg muscles that don’t fit his age. Everything moves steady, the focus on balance and stabilizing. Everyone says it’s tougher– tougher than it looks. The secret is the dutiful simplicity. That’s the fountain of youth, right there,” said Georgie Beall, 58, who lifeguards and teaches swimming lessons and classes at the same YMCA on Newberry Street in York. Rentzel talks as if he seeks no more than to spread his good fortune and dedication with others. Go all the way back to the 1940s when he said he was drafted into World War II, fortunately just before it ended. The Navy man never made it out of the States. He was drafted again into the Korean War. He thought he was going to Germany to be an airplane mechanic, but they made him a company clerk instead. He was fine with that. Again, he escaped combat. He went on to a career as a plumbing and heating salesman around York. He helped raise two sons. And he’s made a habit of coming to the YMCA for early-morning workouts since 1972, though in the beginning that meant running and racquetball and whatever else he could try. Eventually, he moved into the pool. And not long after he gave a water exercise class a try, the group leader took off for Florida. Someone had to call out the moves, so it might as well be him. So as a lot of friends his age began struggling to walk or to do much at all, Rentzel kept coming to the pool. And other believers followed along, always a few more to replace the ones who left. Like Jody Swanson, by far the youngest member on a recent day. She’s 38. Surgery and physical therapy left her in unsolved pain to the point she was willing to try water exercises at sun rise with men more than half her age. “It’s changed my life around,” she said. Her father, Patrick Vaughn, moved into town from Mississippi and heard about her unusual saving grace. So he started coming even though he didn’t care much for the water. The class, he said, gave him and his wife confidence to go snorkeling in the Caribbean during a recent trip. He swears they never would have tried that before. And the longest-running student is Gary Lehr, who just turned 80. He said he was nearly killed in 1986 when another motorist slammed into his car head-on. The right side of his body was shattered, his leg and hip, in particular. Most days, his pain is debilitating and he walks with a cane. He wakes at 5 each morning to give him time to get ready and drive to the “Y” from Jefferson. He comes because the water is temporary freedom. It doesn’t matter that he still doesn’t move as quickly as the others. “I wouldn’t be walking if I didn’t come to this class. I wouldn’t walk anymore. Rentzel doesn’t offer much philosophy about his longevity or what his daily exercise regimen means. He figures that it keeps him moving and able to do the things he believes are even more important. After each class he has a cup a coffee and chats with his buddies in the YMCA lounge. He went on a cross-country train trip with two of them last year. He shoveled himself out after the storm last week — which came after sneaking in his class that morning before the roads got bad. Who does that at 91? One of his friends at the “Y” said most don’t dare try it in their mid-70s. What can Rentzel remember about being that young? He jumped on the joke and smiled. “Not too much,” he said, then looked around at the lockers and his friends and toward the pool. From cradle to grave, swimming might just be the best exercise ever. Here, eight health benefits of taking a lap or two. Swimming is good for just about everyone. It accommodates all ages, stages, abilities and disabilities. There’s also evidence it can slow down the aging process. A long-term study at Indiana University Bloomington’s Counsilman Center for the Science of Swimming found that Masters Swimmers (over age 35) who swam roughly 3,200 to 4,500 metres (about 3.2 to 4.8 kilometres) three to five times a week, postponed the aging process. And not just for a few years but for decades, according to traditional age markers like muscle mass blood pressure and lung function. But you don’t have to be a Masters Swimmer to benefit from swimming. Far from it. 2. Helps you lose weight: Swimming for half an hour can burn as much as 250 calories. 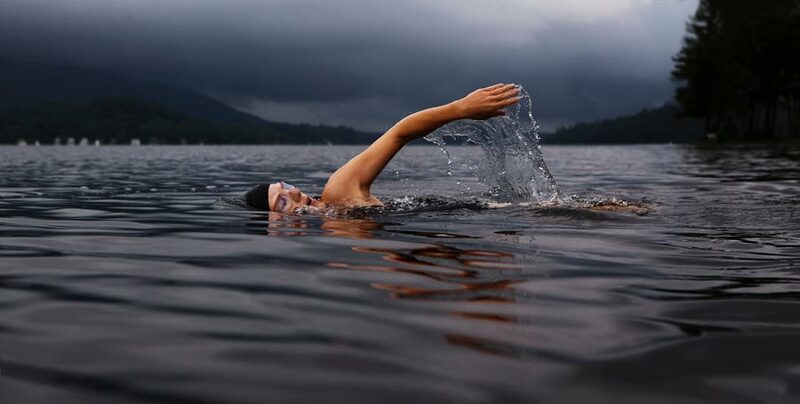 Even a gentle swim can burn 200 calories. Since water is about 800 times denser than air, your body has to work harder in the pool, even though it might not feel like it is. Gliding through the water can be a glorious feeling. 4. It’s a great aerobic exercise: Swimming increases your lung capacity and gives them a solid work-out. It’s also been identified as a good form of exercise for people with asthma. 5. Choose where you want to tone up: Since swimming involves a variety of strokes that use different muscles, you can target the areas you most want to tone – be it legs, upper arms, or stomach muscles. Keller’s website includes techniques for doing each stroke. 6. It’s cheap: Unlike some sports which require a lot of equipment, swimming just requires a swim suit, bathing cap and a pair of decent goggles and of course a pool, which most cities and mid-size communities have. It’s also a great summer exercise since you can cool down and work out at the same time. 7. Suitable for all ages: That’s why they say swimming is ‘cradle to grave.’ You simply adjust the pace to your age and ability. If you aren’t already a swimmer, but think you might like to start, first check with your doctor to make sure there aren’t any health issues to take into account. You might even want to enroll in swim lessons. An instructor can not only help build swimming skills, but alleviate any fears you might have about the water.